A few days ago Ford unveiled the new Ford Explorer and announced that the range would be completed with a hybrid version and a sport variant. Finally, we will not have to wait long to know these two new versions. On the occasion of the Detroit Motor Show, Ford unveiled the Ford Explorer ST 405 HP and the Ford Explorer Hybrid Limited , which combines the 4-cylinder EcoBoost with an electric motor. The Ford Edge ST will not be Ford’s only high-performance SUV. 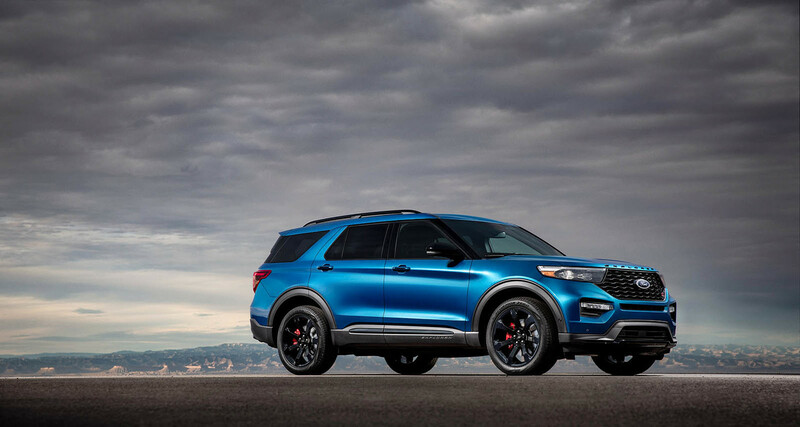 The Ford Explorer ST is a powerful sporty SUV of 400 hp (405 hp) that debuts in Detroit with the Ford Mustang Shelby GT 500 . The Explorer ST, however, does not use a V8 but a supercharged 3.0-liter V6 that delivers 405 hp and 562 Nm of torque. It is associated with an automatic change of 10 relations and integral traction. The suspensions are, says Ford, firmer. The Explorer ST will be available with two equipment packages, the ST Street Pack and the ST Track Pack , highlighting this one with its 21-inch wheels and more powerful brakes with painted red tweezers. Although, the really remarkable thing would be to know at what moment someone thought that a Ford Explorer would be a good car to participate in a track day … In terms of performance, Ford has not revealed much, except a top speed of 230 km / h.
Although a Ford Explorer ST does not spark the imagination like a Shelby GT 500, it is presented as an affordable alternative to the BMW X5 and Porsche Cayenne. And as with the Cayenne in Porsche with the 911, if the Explorer ST sales help fund the next generations of Mustang and Raptor, welcome. The Ford Explorer Hybrid Limited , meanwhile, inherits the 3.3-liter EcoBoost 4-cylinder that, together with the electric motor, delivers a combined total power of 318 hp (322 hp). Ford has not disclosed the consumption approved by the EPA, but ensures that the Explorer Hybrid rear-wheel drive (will also be available with all-wheel drive) has a range of 500 miles (just over 800 km) with a single deposit. Of course Ford does not reveal the capacity of the tank (in the Explorer of 2018 it is 70 liters). The Explorer Hybrid will only be available with the Limited intermediate finish. Its equipment includes an audio system with 14 Bang & Olufsen speakers, heated seats in the second row, electric front seats and active noise cancellation via the speakers.